I ment to post this yesterday but time got away! Did anyone notice how pregnant Tigger looked in the Igloo picture? 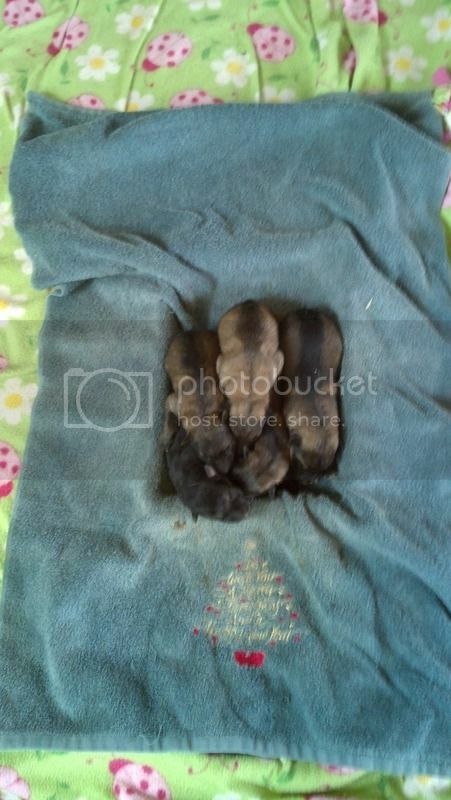 Tigger had 10 nice pups - - - 5 of each - - - Kinzie checked before I got a chance and she was right on the money. With that many when I am around I will pull 5 away in 2 hour shifts so that the small ones do not get left out. These are the girls getting some alone time with mom as soon as she gets her restroom time done. These are the boys - - - an old cake pan keeps them warm and cozy till it is time for a shift. If I get a small pup I will leave it with mom all the time and shift the others - - - about 3 days of that and there will no longer be a small one as it will catch right up. Re: Tigger did it again! Glad everyone's healthy George. Good looking litter. There's 2 dates in time they'll carve on your stone, and everyone knows what they mean. But what's more important is the time that is known, as that little dash there in between. Thanks, The biggest litter I ever had was a black and tan german shepherd named Lady that gave birth to 19 and saved 17 - - - we supplemented the pups and fed her all she wanted with plenty of milk to drink and she did well - - - I did not let her rebreed for 2 cycles to allow her to rebuild her condition. I applaud you for taking such good care of your dogs! You are to be commended for being such an austute breeder. confiscated all the dogs and the cats. They appeared healthy, or so the Humane Society place said, they were just lacking room. Now they will be taken care of veterinarian wise and put up for adoption. People are crazy! The laws in Ohio must be much laxer than here - - - I went to a breeder by Cleveland that had 500 female German shepherds in a pole barn about 60 X 60 - - - cages were about 3 X 3 X 12 and stacked 3 high. Little Amish girls running around taking care of pups ( they said they have 5 to 8 litters a day ) and little Amish boys scraping under the bottom pens. I was taking to one of the older boys and he said they wean at 3 weeks so the female will breed back quickly and can get up to 10 litters from a female before she turns 5 and then get rid of her. Most of them never see daylight their entire life. 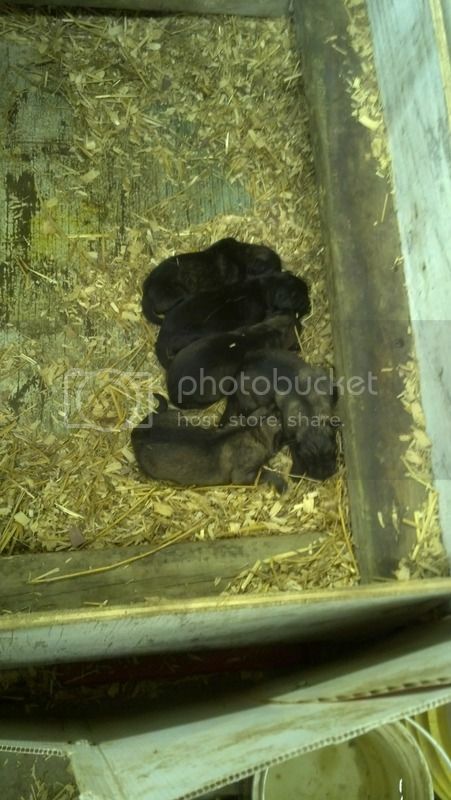 I bought a 3 year old male from them to breed with - - - when I turned in his papers the AKC required me to DNA him - - - this is required if they have 6 or more litters - - - I asked and he had already sired 36 litters but the Amish are not required to do DNA. He has been a great sire but I had to teach him to be a dog as he had never had a color on and had never been out of an 8 X 8 pen. This is not the way I want to make a living! 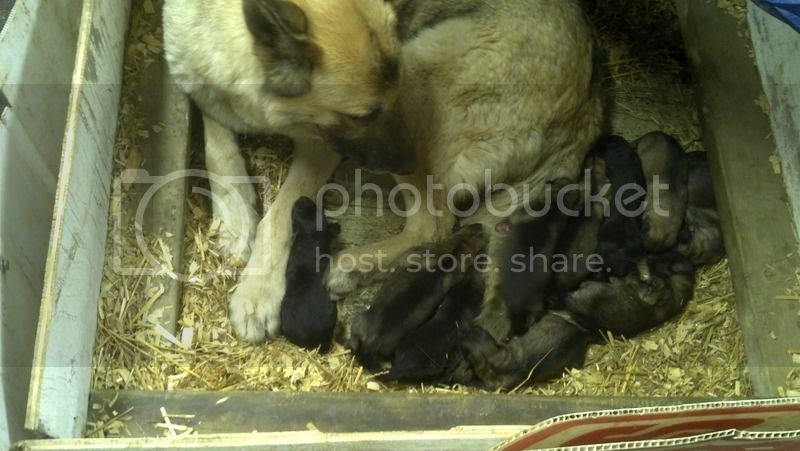 But if they really have 5 litters a day that should be about 40 pups a day - - - at $800.00 each that is a lot of income! I know they have big extended families but that is still a lot of money!